It’s funny how when you ask someone what their favorite cookie is, the answer is generally chocolate chip or peanut butter, yet every time I pull out a batch of these everyone says it’s their favorite kind. If you like, use ¼ cup canola oil instead of the combination of butter and oil. Make sure you don’t overbake them; they need to stay chewy. In a large bowl, combine the butter, molasses, brown sugar, egg and vanilla. Stir until well blended and smooth. In a medium bowl, stir together the flour, baking soda, cinnamon, ginger, allspice and salt; add to the molasses mixture and stir by hand just until you have a soft dough. Roll dough into 1”–1 1/2” balls and roll the balls in sugar to coat. Place about 2” apart on a cookie sheet that has been sprayed with nonstick spray. Bake for 12–14 minutes, until just set around the edges. Transfer to a wire rack to cool or serve warm. 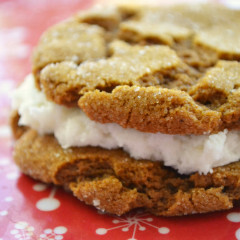 Once cooled, spread half the cookies with frosting and top with a second cookie, if you'd like to make sandwiches. Store extras in an airtight container or freeze. Makes 2 dozen cookies, or 1 dozen sandwiches.